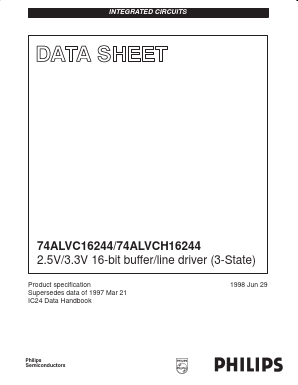 The 74ALVC16244(74ALVCH16244) is a 16-bit non-inverting buffer/line driver with 3-State outputs. The device can be used as four 4-bit buffers, two 8-bit buffers or one 16-bit buffer. The 3-State outputs are controlled by the output enable inputs 1OE and 2OE. A HIGH on nOE causes the outputs to assume a high impedance OFF-state. The 74ALVCH16244 has active bus hold circuitry which is provided to hold unused or floating data inputs at a valid logic level. This feature eliminates the need for external pull-up or pull-down resistors. The 74ALVC16244 has 5V tolerant inputs. 74ALVT16244 16-bit buffer/line driver; 3-state View NXP Semiconductors. 74ABT16244A 16-bit buffer/line driver; 3-state View NXP Semiconductors. 74ALVT162244 2.5V/3.3V 16-bit buffer/driver with 30Î© termination resistors (3-State) View NXP Semiconductors.